‘Olive Skye’ will essentially be used as a general purpose vessel, towing cages out several hundred miles into the Bight from December through February and bringing them back to the tuna farms in Port Lincoln. 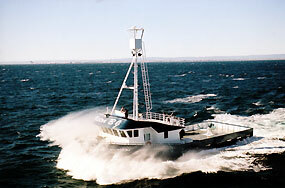 The vessel will then be used to both service and feed the tuna in the farms for the remainder of the year, making the 45 minute journey out from Port Lincoln daily. She has four brine tanks to accommodate live bait, and the Hiab 300-S 12 tonne crane on the main deck allows for the loading and stowage of pallets of bait on her spacious and uncluttered main deck wit hits single towing bollard. A Caterpillar 3412C developing 720hp at 1,800rpm was the engine of choice. This V12 four stroke diesel was purchased from Energy Power Systems and was selected to provide excellent fuel economy and consistent performance over the required operating range. A Twin Dixc MG 5202 gearbox of 6.11:1 reduction is coupled to the engine and a four bladed skew plan Veem propeller. They also opted for two Caterpillar generator sets, the first a Caterpillar 3056 naturally aspirated engine and generator rated at 70kVA, and the second a turbocharged, after-cooled Caterpillar 3056 with a 100kVA generator. Again the selection of these generator sets was determined by the combination of economical operation with performance sand reliability. 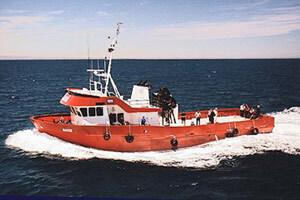 Manoeuvring is assisted by a 100hp hydraulic side thruster. The electrical installations were done by Lesan Electrical, and included the installation of the Schneider switchboard. This switchboard was manufactured using Schneider’s state-of-the-art range of technical engineering products including the Powerlogic range of power monitoring equipment which monitors voltage, current, and power factors to the thirty-first harmonic, as well as together parameters. It includes a range of Merlin Gerin circuit breakers that provide complete discrimination throughout the entire vessels’ distribution system, greatly reducing down time in the event of an electrical fault. The control system employs the Telemacanique range of equipment to provide total reliability on all monitor control equipment which has a very low heat emission, reducing temperatures in the engine room, and incorporates Telemacanique’s “Protected LED” technology. The air conditioned accommodation has been finished to an exceptionally high standard with the skipper’s cabin on the main deck, and crew of engineer and two deck hands comfortably housed in a brightly lit and generous three berth cabin below, another three berth cabin below, another three berth cabin being provided for the three divers who will be aboard to attend the cages on the tow in from the Bight. The mess area is roomy, and equipped with the latest sound systems and television/video/CD player for relaxation off watch. The wheelhouse is functional with the wheel slightly off-centred to port, and windows in the aft bulkhead giving an unimpeded view aft. The Danta woodwork used throughout has lent an almost luxurious touch to all interior spaces. In fact, everything about ‘Markane’ is functional, yet also traditional, and the boat should prove a pleasant and workable home for her crew either on the long tow in from the Great Australian Bight, or when servicing the tuna farm on a daily basis. ‘Olive Skye’ looks to be the perfect vessel for her intended role and has performed beyond its owner’s expectations since launching, proving seaworthy and satisfactory in all respects.